Aizhai, located in Dehang Village of Xiangxi Tujia and Miao Autonomous Prefecture in Hunan province, is 15 km away from the west of Jishou. Sichuan and Hunan interprovincial highway goes across the village. Aizhai belongs to Dehang Town, Dehang Village is an ancient Miao Town and the scenery there is beautiful. 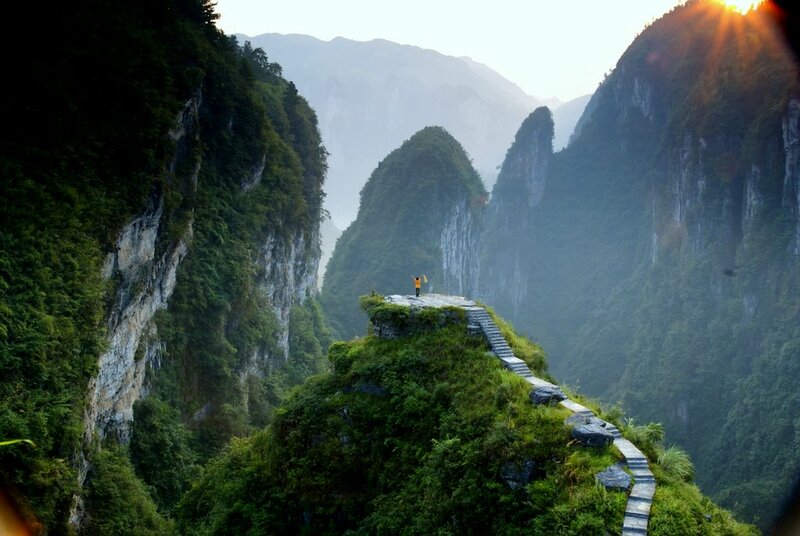 Aizhai is surrounded by towering and steep mountains. The beautiful Dong River joins Dehang Creek here, which creates a fertile Riverside Garden for Aizhai together. Through Aizhai, Dong River has its own unique style. First, it turns a corner, and then along the old river, it goes near the mountain and through the village to wear. The river is clear, like Yuye, and runs all the time. There are precious “giant salamander” and “Peach blossom worm” that Miao people like eating in the river. There are green willows and bamboos. Cylinder wheels are turning and Shinianpan that depends on waterpower is also spinning on the bank of the river. Dehang Village is a Miao village with ethnic characteristics. Miao people hold “Hundred lions meeting”, “8th, April” and “Catch the Autumn Festival” and other traditional festivals in this place once a year. During Festivals, Miao people of Dehang Village will joy together and communicate with flowers, batik, lace, paper-cut, silk, bamboo, medicine and various agricultural and sideline products. Young men and women often stay by the roadside in this day, dating someone, seeking for lovers and making a personal relationship quietly, which is called “The trend of Ganbianbian”. 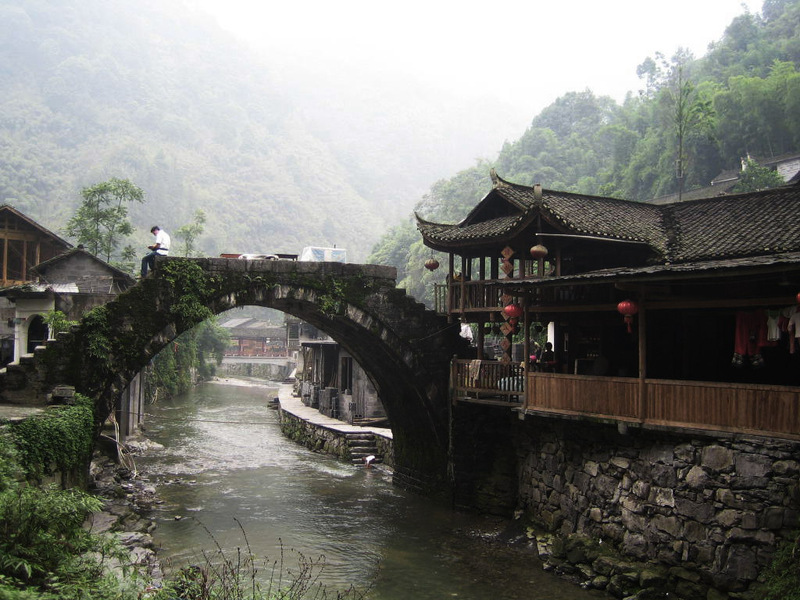 Aizhai is the ecological, cultural and tourism town that is mainly Miao population. There are 16 villages, 1 community and 1 neighborhood committee, 55 natural villages, 69 villagers groups and the total population is 15680. The surrounding beauty spots are Dalong Cave, The Ancient Miao River, The Border Town and Lvdong Mountain. Inside of Dehang Village, there are Trailbreaker Statue, The state-level scenic areas – Dehang folk customs garden, and the first cloverleaf junction of our country. 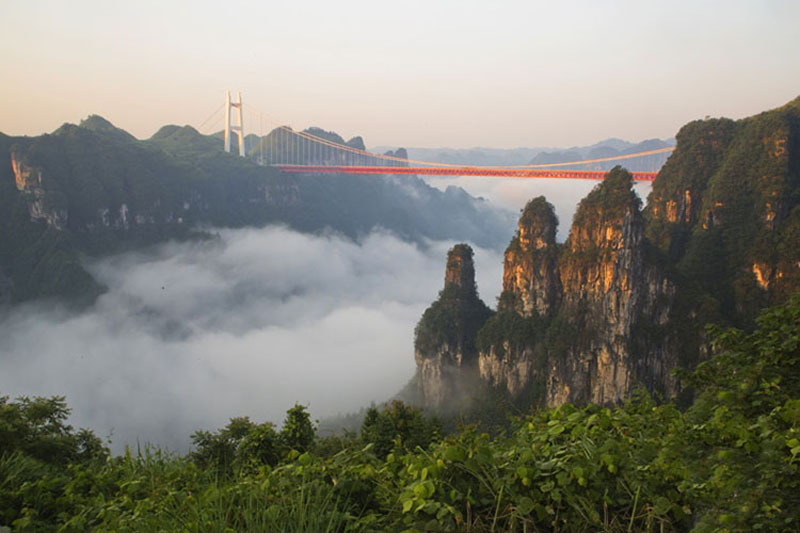 Dehanga is in the famous center town of Zhangjiajie — Mengdong River — Jishou — Phoenix tourism gold line, is a new hot tourist area of the southwest of the country, and is known as the pearl town of Wuling mountain. The spectacle of Aizhai highway in Xiangxi is only separated by a river from Aizhai. The famous Sichuan and Hunan Road starts from here. Standing in this town, you can look up to see many cars running on the mountain. The whole road is dug out on a cliff. The length of the highway is nearly 7 kilometers, the relative fall is more than 600 meters and there are eighteen 180°-turns. 1. The main span of the bridge is 1176 meters, which sets a record of the first suspension bridge across the gorge in the world. 2. The structure design is completely separated tower from girder, creating the first in the world. 3. The framework design first adopts “Guisuohuayi method” to erect steel truss girder, creating the first in the world. 4. The sling structure first adopts rock anchor, and uses prestressed steel and carbon fiber as material, creating the first in the world.